Wondering where all the updates have gone? Eaten by Twitter! Here’s a roundup of the last three months and more. 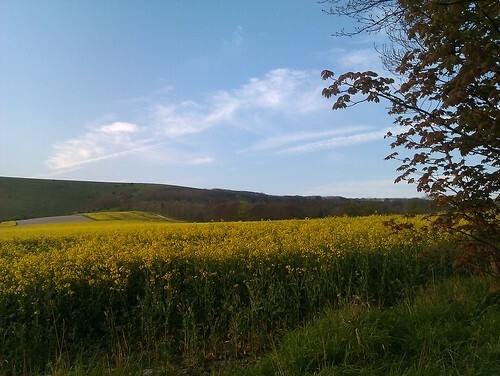 It’s been an interesting spring so far in Firle. 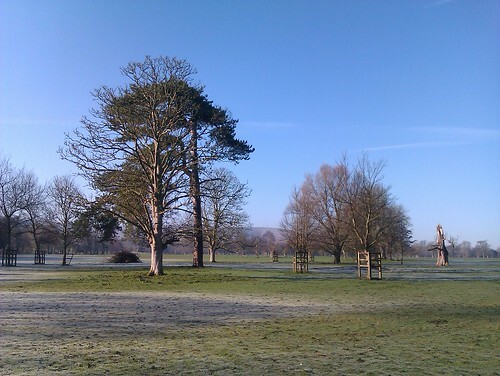 Highlights include two Egyptian Geese, first seen on 21 April and then again today, in Firle Park. 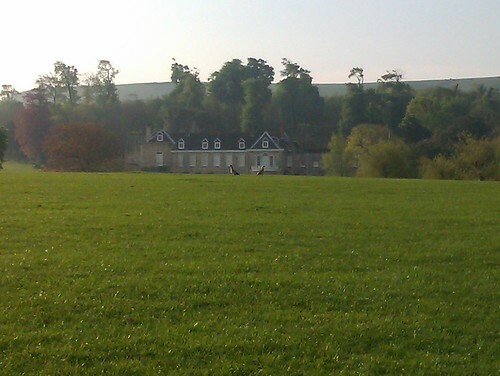 Below is an unhelpful record shot of the birds in front of Firle Place a couple of weeks ago, when I first noticed them as flew noisily over the village. Today they were on the grass just beside the main access road through the park, near the cricket pitch; when disturbed they flew off towards the Decoy Pond. On neither occasion I’ve seen them have I been carrying binoculars, but it was obvious that the birds today were quite different to one another. One has a pale head (possibly more so than usual – it’s a common variation, apparently) while the other has a darker, rufous head, which would indicate a juvenile. This seems odd though – is it likely that any Egyptian Geese would be in this plumage in early May? I guess I need my binoculars handy for the next sighting. Incidentally, it’s not always obvious that we have any geese at all in Firle, but there are a handful of both Canadas and Greylags. They can often be seen in the grazing pasture directly north of Firle Place, just to the east of the Decoy Pond and stream, and often with the local Herons stalking nearby. The other main surprise of the spring was the presence of a Green Sandpiper in the Park. Although they’re regular along the Reach at Glynde and Beddingham, I’d thought they were at best an accidental visitor to this side of the A27. But at least one bird was present from mid-March well into April along the stream that feeds the Decoy Pond; and on two occasions it’s likely that there were two birds. Had it or they been there all winter, in low profile? This stream isn’t somewhere I’ve checked much in the past, so it’s entirely possible that they’re a regular visitor, not the rarity I’d imagined. A closer eye on this stream over the last few weeks has also revealed other good records. There have been multiple sightings of a pair of Grey Wagtails and a pair of Teal, while the Decoy Pond itself produced my first Firle records of Tufted Duck and Coot. 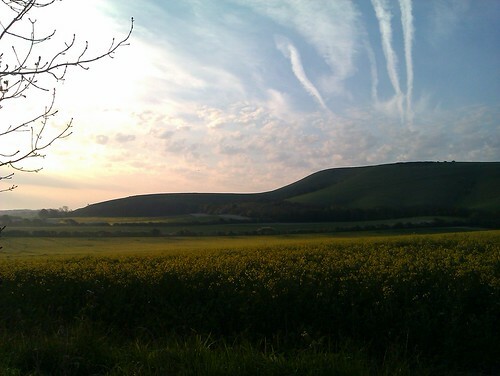 I find it amazing that a relatively small area such as Firle parish is still giving up its secrets to me, even after six years’ living here, on and off. On that note, seeing my first Barn Owl in ages up the Bostal Road on 4 May was, I thought, quite a find – until I spoke to a villager who lives opposite the field in question. She reported having seen it regularly in the summer months over the last three years. So much for my local expertise. There was a healthy flock of Fieldfares in the Park late in the winter. On the morning of 13 Feb they decided to feed on the cricket field, and numbered in the the region of 400-500. Up to around a hundred lingered through until late March, along with a few Redwings and Starlings; with the final 14 birds seen on the morning of 7 April. In terms of incoming birds, the first Chiffchaff was heard on 10 March (fairly typical) and the first Blackcap on the 26th, after which date the latter increased rapidly. They seem to be singing from every available copse and hedgerow this year. Swallow and House Martin arrived in the first week of April (per Paul Stevens) but the numbers of martins has only built up in the last week or so. There are now 8 -10 feeding over the village rooftops at any one time, a number that should swell significantly through the summer. Just one Wheatear (for me) so far- a bird on a wire along the Bostal Road – but Whitethroats seems to be everywhere. And while we’re on birds beginning with ‘W’, one of the best features of the spring so far has been the presence of a Willow Warbler at the allotments since 10 April. This is, to my knowledge, the first to have held territory anywhere close to the village for the past six years; it seems the scrubby area between the allotments and school playing field has drawn this one to linger. Fingers crossed – and another singing in Firle Plantation yesterday could also be on territory. 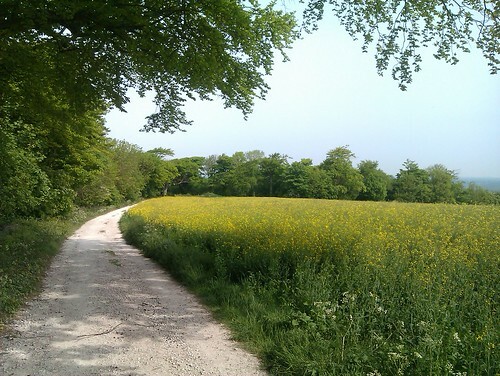 Paul S recorded both the first Lesser Whitethroat and Garden Warbler (neither common in Firle) along the Old Coach Road in late April. There was another Lesser singing along the Bostal Road, near the school, on 28 April. As yet, still no Firle records of Turtle Dove or Cuckoo this year (sadly, this isn’t a surprise on either count – at least the latter still turn up in Glynde). We’re waiting for our first 2011 Swift, Hobby and Spotted Flycatcher too. Herpetological titillation has come in the form of a couple of Slow-worms in the garden and two Common Lizards on the allotments. Finding a lizard in Britain is always feels slightly Mediterranean – although the range of the Common Lizard apparently extends into the Arctic Circle. The number of Orange-tip butterflies (in Firle and elsewhere) has been a real feature of Spring 2011 – I don’t recall seeing anything like this many in any previous year. On several road journeys they have been by far the most abundant species seen. Speckled Woods have been common for a couple of weeks now, while the first Wall was out yesterday along the Old Coach Road near Place Farm. My plant knowledge is still woeful, but I was pleased to come across some Wild Garlic in the Plantation yesterday. Always helpful when a plant’s smell helps you identify it so easily. This entry was posted in Local sightings, photo by Charlie Peverett. Bookmark the permalink.